LuxEco Living believes that being eco-friendly is smart and easy and it mustn’t come at the expense of having a modern and stylish lifestyle. Living LuxEco doesn’t necessarily mean that being Green equates to “Less is More” and consumers should just do without. In fact, “More is More,” if you are equipped with the right information to make the best choices to support a sustainable, healthy, non-toxic, eco-friendly and socially responsible community. Modern. LuxEco looks not only to style “of the moment” but beyond that and into the future of eco-rich luxury. Stylish. There are so many ways of living Green. Living the LuxEco way means that you value beauty, fashion and the aesthetics that are on the vanguard of taste BUT beyond passing trends. 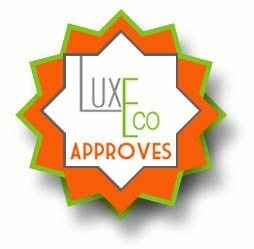 Sustainable– Any product that LuxEco puts its Seal of Approval on must support eco-friendly materials and production processes that do not negatively impact the environment now or in the future. Better yet, we look for companies who manufacture products in harmony with the environment and look for ways to make the planet more healthy and vibrant. Health. Not all products that are sustainable are necessarily healthy and non-toxic. Living LuxEco means that your are living a balanced, happy, healthy life mentally, spiritually and emotionally. LuxEco searches out products that support a health for oneself, their families, their communities and the planet at large. Timelessness. LuxEco knows that we will all continue consume but instead of supporting an out of control wasteful consumership/production/pollution cycle of our current marketplace, we can can take a more eco-friendly and proactive approach to our shopping choices that respects our environment, our inner ecology and the global society. LuxEco values Timelessness and heirloom items that are meant to be treasured for years and years to come (and not end up in a landfill). Stewardship. Living LuxEco means taking the responsibility to respect and nourish our environment and rebuild it where it has been damaged, keeping it healthy and vibrant for generations to come. Stewardship is not a passive act, but an engaged proactive approach to preservation and conservation. Beyond ecology, it also speaks to global social justice issues and human rights issues. We must take care of our world and each other. We are all interconnected.